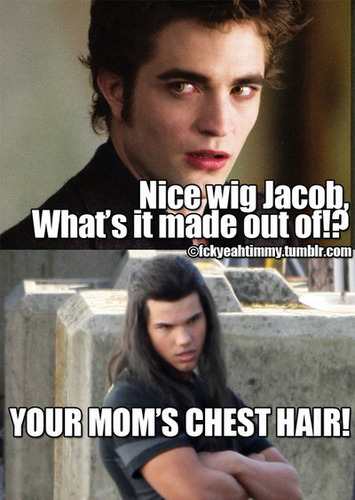 Nice wig, Jacob.. Another Mean Girls reference. Very nice. =D. Wallpaper and background images in the Critical Analysis of Twilight club tagged: twilight fan art mean girls wig chest hair jacob edward fckyeahtimmy. I LOVE Jacob's facial expression! Lol... =D Jacob looks like such a girl! lol, Talk about b**** fight! !